What began as a love of horses, has turned into a life-long passion. In the saddle, Kim is a fierce competitor, focusing primarily on jumpers, including at the Grand Prix Level. When she’s not riding, she is helping clients of all ages and ability to realize their true potential. 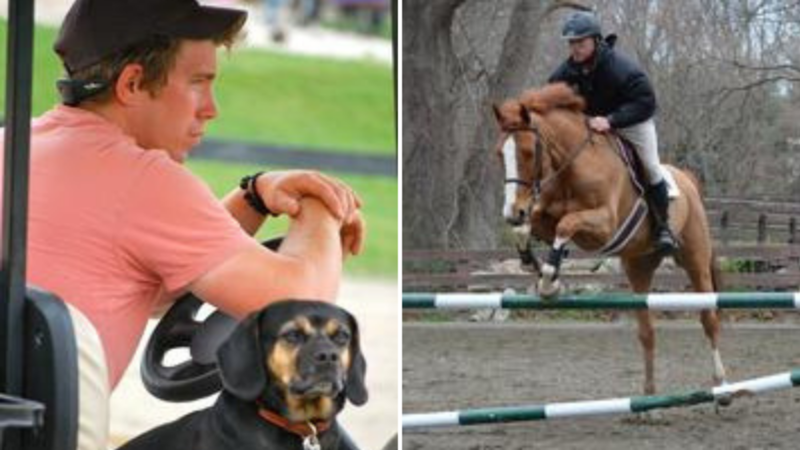 Twin Bays Stable has successfully trained riders in the hunter/ jumper and equitation rings — from short stirrup to Grand Prix. While Kim’s students have earned top honors in highly competitive show arenas (regional/ zone/ national finals), she is always happy to work with anyone who willing to learn. Her ultimate goal is to have each of her students become safe, courteous riders with a lifelong love for horses. Twin Bays Stable is named after her first two horses, Ruby and What, both dark bays. Even now, many of the horses in the barn are bays, of course, with a few exceptions! Kim keeps her retired horses close to home so she’s never too far away for a treat and a pat. Rory Gallagher is the barn and road manager at Twin Bays Stable. He is extremely knowledgeable in all aspects of horse care and barn management. Rory is in charge of keeping the horses healthy and happy, whether it’s home, or away at shows. He lives on the property, organizes the day-to-day routine, manages night check, and helps with any and all special needs and care. Rory also assists with planning the horse show schedule on the road and is in charge of their care and preparation while showing.